For the last 5 years, Quest procurement events have attracted over 2,200 attendees. 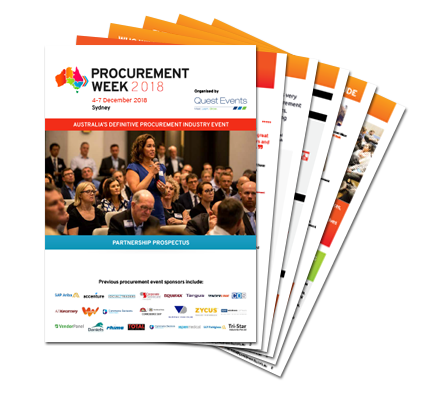 Procurement Week brings together these senior leaders from multiple industries (and more), to share ideas, experiences and to advance the procurement profession. Procurement Week will unite the industry as a whole at the only one-stop-shop procurement event in the country. Australia’s definitive procurement industry event will feature international keynotes, new and cutting edge content streams, in depth learning sessions, a CPO Summit, interactive exhibition area and unparalleled networking. Procurement Week will be the must attend event for anyone working in procurement – from junior buyers, sourcing, category and contract managers right through to the CPO. What makes Procurement Week unique?